Home > Blog entry > What will it take to make Balkan leaders realise new coal plants are a liability, not a gold mine? This article first appeared in Balkan Green Energy News. In April this year, the EU proved that whatever difficulties it might be going through, it can still make momentous decisions. 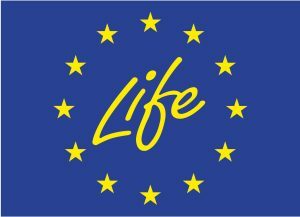 It approved new pollution control standards for power stations, entitled the LCP BREF (1) The name might sound obscure, but the results should be concrete: The new standards are projected to save up to 20 000 lives annually across the EU. On the EU’s doorstep in the Western Balkans, however, you would hardly know the LCP BREF existed. Almost all the countries in the region are planning to build new coal power plants, and there has been virtually no mention of the need for them to comply with the new standards. This is strange, because not only is compliance with the new LCP BREF necessary for EU accession, but most Western Balkans already stipulate it as part of their domestic pollution control legislation (2). This means that as soon as the standards enter force in the EU this year, they also enter into force in most of the region. Let’s be clear here: the LCP BREF is not a panacea. It limits emissions of SO2, NOx, PM10, HCl, HF and mercury, so it makes a great contribution to reducing coal’s health impacts. But it can’t do anything about the biggest problem with coal: CO2 and its contribution to climate change. There is no filter that can stop CO2 emissions, and if we are to limit climate change to 1.5-2 degrees, no new coal plants can be built. Unlike climate science, BREF is legally binding, and attempts to ignore it will likely backfire even sooner than attempts to ignore climate science. Whether you have to comply with the LCP BREF right now or in a few years, it’s not something you want to ignore. 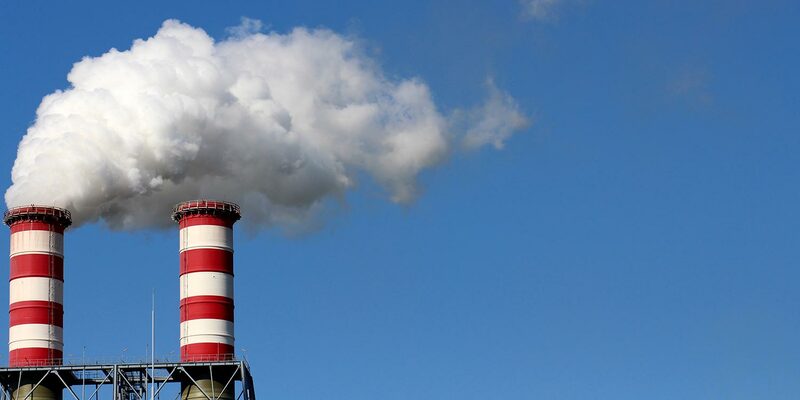 With power stations lasting 40 years and more, they need to be designed in line with the very latest technical and environmental standards, and their promoters need to anticipate the rules coming up within the next few years. Failure to do so means additional and potentially expensive retrofits just a couple of years after a plant has opened. With the chances of new coal plants being viable already at rock bottom, such additional costs could easily increase the risk of stranded assets. Only very few EU countries are planning new coal plants, because of low electricity prices, the growth of renewable energy, CO2 costs, and pollution control legislation that is gradually making polluters, instead of the public, pay the health costs of coal. Yet governments and utilities in the Western Balkans are not doing their homework about recent trends and new legislation that awaits them in the next few years, with the result that their planned projects are dangerously out of date. Earlier this year we revealed that none of the planned coal power plants seem to have properly taken the costs of CO2 into account in their financial planning. Now we’ve crunched the numbers for the LCP BREF and found that none of the plants has proven compliance with the new standards either. There are eight units currently being actively planned in the region. Out of these, five would violate the new standards while for three there is insufficient information available. 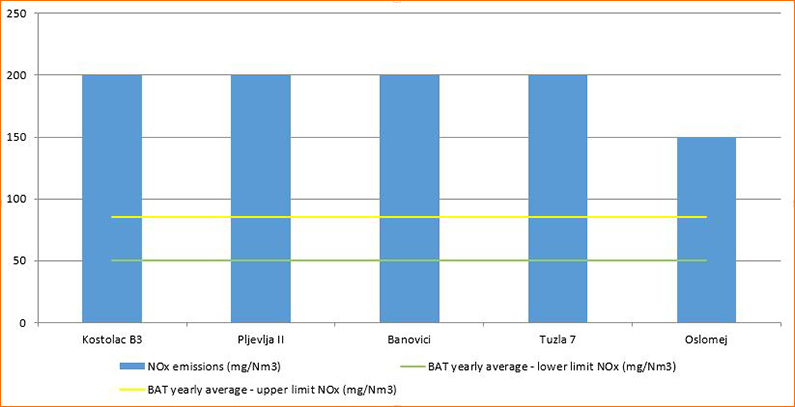 Kostolac B3 in Serbia, Pljevlja II in Montenegro, and the Oslomej reconstruction in Macedonia have been designed in line with the older Industrial Emissions Directive (IED) Annex V standards, but not the new BREF. 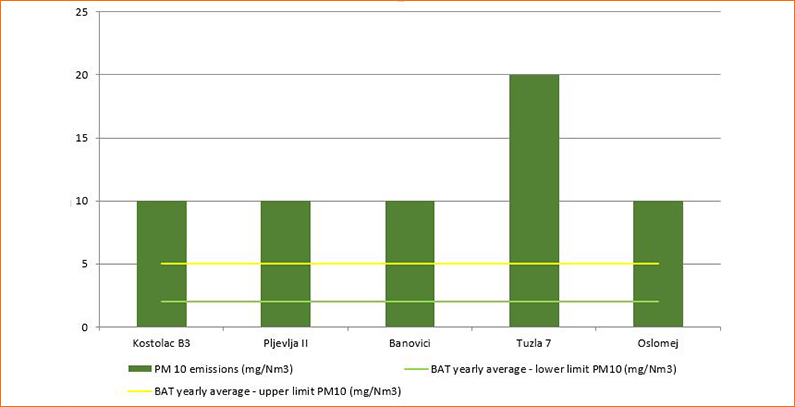 Tuzla 7 and Banovići in Bosnia-Herzegovina don’t even go this far: Tuzla 7 is bound only by the even more outdated local legislation while the environmental permit for Banovići is unclear about what standards are relevant. For the remaining three units, Ugljevik III units 1 and 2, and Kosova e Re, the information about likely emissions is still unclear. 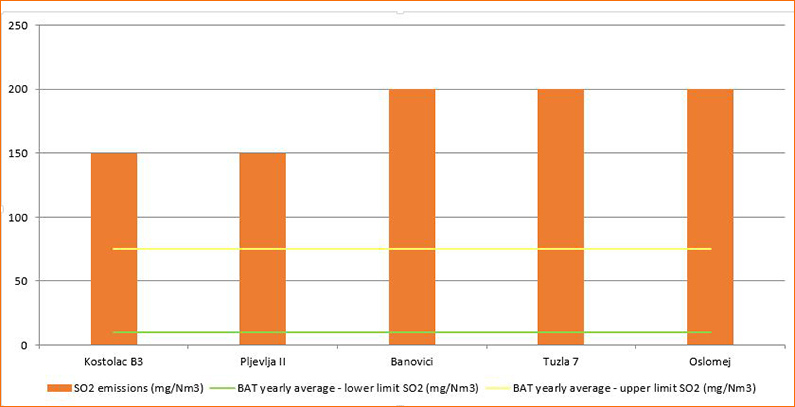 Kostolac B3 in Serbia is the only plant for which the new BREF has even been mentioned in its official documentation. It is currently undergoing an environmental impact assessment process, in which local groups have commented on the need for the plant to comply with the BREF. The only reaction so far is an amendment in the study stating that the plant would be an existing plant under the BREF and thus allowed to pollute more than new plants. Even if some retrofits are necessary, the study argues, this is a normal procedure after running a plant for a few years, and thus nothing to worry about. Neither of these claims is true: Any plant receiving its integrated environmental permit after the LCP BREF enters force in the EU is a new one, according to the BREF definitions, and has to stick to the highest standards. As for undertaking retrofits, the study authors should really check the plant’s feasibility assessment, which shows that the plant will be unviable even with a low CO2 price. The story is not dissimilar with Pljevlja II in Montenegro. Despite being hailed – like all the plants – as being in line with EU standards, it turns out that it is in line only with outdated ones. Local NGOs pointed out during the environmental assessment process that the plant must comply with the new LCP BREF, but they have received no reaction from the authorities as yet. Montenegro and Serbia may seem like the most alarming cases due to being ahead of others in EU accession, but Bosnia-Herzegovina is if anything a more worrying case, due to the number of projects planned. The Stanari lignite power plant which started commercial operation last September is already out of date compared to the Industrial Emissions Directive and will now be out of line with the BREF as well. If Ugljevik III, Tuzla 7, and Banovići are all completed and all out of line with the BREF, the country will end up with a significant burden on its hands. If the Balkans electricity utilities really ran on commercial lines, as they are bound by the Energy Community Treaty to do, they would never risk these projects. The new LCP BREF is but one more indicator that coal is an increasing liability, and the Balkan countries should be looking much more carefully at what’s going on around them. After all, the region has ample potential for wind, solar and energy savings combined with a relatively small population, so if this region can’t make a transition to sustainable energy, who can? Albania, the Federation entity of Bosnia-Herzegovina, Kosovo Macedonia and Montenegro. Serbia and Republika Srpska both require the application of best available techniques but do not specify that the EU reference document should be used.